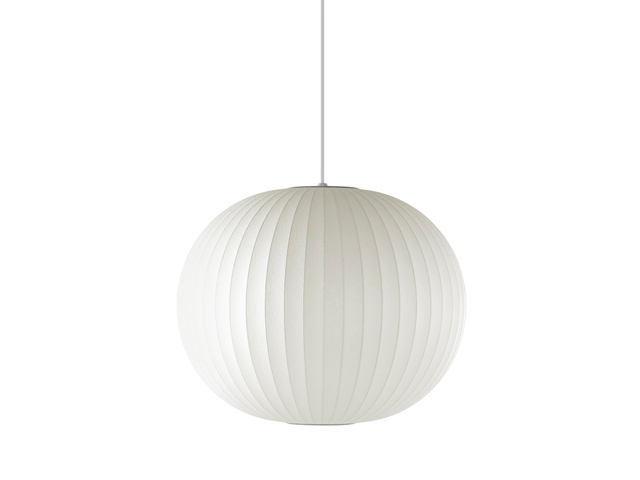 The Nelson Ball Bubble Pendant is a full, perfectly round sphere that fills any interior with a warm, diffused light. A ceiling plate allows it to delicately float overhead. George Nelson was inspired by a set of silk-covered Swedish hanging lamps when he originally designed the Bubble Lamp series in 1952. In charming spherical silhouettes, the Nelson Bubble Lamps add a touch of softness and luminosity to interiors. The Ball Bubble Pendant is available in three sizes and it's perfectly rounded form is attached to a brushed nickel-plated steel ceiling plate with a 6 foot long cord. The Bubble Lamps were first designed in 1952, when Nelson was impressed by a set of Swedish hanging lamps. Their prohibitive price prompted Nelson to design his own in a way that made them more affordable. This timeless collection of lamps complement contemporary interiors as easily and beautifully today as they did mid-century homes.